She is 2 months now. We got some new items for her. One is this chamber pot. I hold her on it soon after she wakes up or when she thrashes her arms and legs. I began to use it one week ago and I succeed four or five times a day. The next ones are books. My husband got a thick book with 365 short stories. 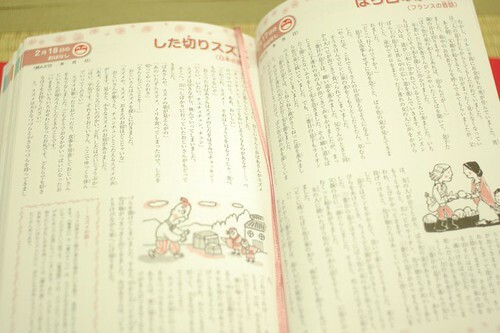 It seems for older child, but Miyu likes listen to the stories. I've read more than 60 stories. And we got some picture books for her too. She likes them too. But sometimes she doesn't look at them but my face. These days she speaks to me a lot so I want to know what she tries to tell me. I live only for her. I don't have enough time to do anything else but I'm really happy now. My husband helps me even though he comes back home by the last train usually. Every morning he washes her diapers. Oh, I got one more thing, Swimava! She likes it very much (* v *). I just found your blog and I love it! I'm so happy you love being a new mom. My daughter will be turning 1 tomorrow and I have been reflecting on her birth the last few days. Thank you for sharing your hand made life. It's such an inspiration! She's so cute! And growing fast. Enjoy your time with her. Oh Mai, she's so beautiful. I love those chubby little cheeks. And that Swimava is nifty! I wish I had had one for my son when he was small, but he's much too big for it now. i'm so happy for you! she looks so cute!! so so cute!! !^^ and what a loving husband you have!! i really like that swimava!!! awesome :P but i'm not sure what the chamber pot is for though.???? What a darling child! and growing so fast and beautiful. 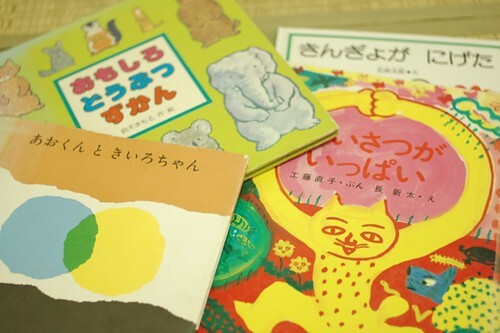 One of the books you have is the same one that I had as a child "little blue and little yellow" I still remember the story even though it was fifty years ago! She is adorable!! enjoy every moment with your baby, they grow up too fast!! Hope she'll grow up with wonderful life. She is so cute! that swimming thing is pretty cool and looks to be a ton of fun. 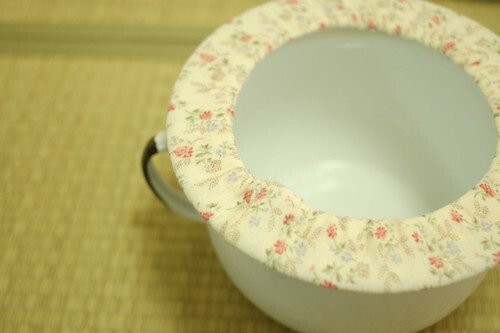 i'm amazed with the chamber pot. my two year old just used the toilet for the first time yesterday. she is just so very sweet. good to know you're both doing well , and thank you for sharing ! She is gorgeous! I was surprised to see that you are already potty training her. I guess it's never too early! I am ashamed to admit that I never tried before my son turned about eight or nine months old! 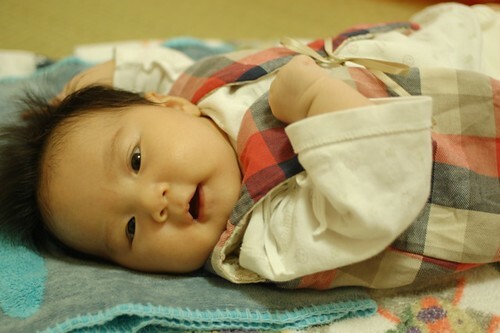 I look forward to your updates of little Miyu. You and Haru and wonderful parents -- thank you for sharing with us! p.s. - I haven't seen a chamber pot since I was a little girl! Little Tomato/Miyu is so beautiful. I'm glad you are getting to spend this time with her. Every moment with your baby is precious. You can blog (and sleep) when she's bigger! :) We'll wait!!! Oh, she is soooo sweet! You are very lucky! She is even more beautiful!!! The chamber pot? At 2 months? Well, it's great! Have a nice time with your baby! kisses from Portugal. chamber pot? at 2 months? UAU! My daughter only begin with it when she was 2 years old! She is growing so fast! Enjoy! HI Mai, she's so adorable. And that Swimava, it's the first time I've seen it. I wish you and your husband all the happiness in this world. Miyu is soo adorable and growing fast! :) YOur hubby is so sweet to help you out even after a hard day's work. :) Have a lovely merry happy day and love to you! Wow. So cute. It is very different to potty train now but maybe its easier. Baby does take a lot of attention but make time for just your husband too. I love it that you're EC'ing and using cloth diapers. We're a cloth-loving family. I might get brave and try EC'ing with our next baby in a year or so. A chamber pot! Is this common in Japan? Why do we not know of it here?? You're a lovely family. You are a very nice person, you deserve to be happy! Little Miyu is so adorable!!! I'm always looking forward for your next entry even if it's not about sewing. this is my first time visit..
How wonderful! I am so happy for you and your little one! It sounds just perfect. She is a little darling!